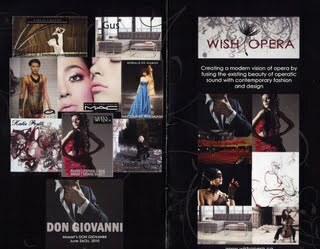 The mission of the newly minted Wish Opera is to create "a modern vision of opera by fusing the existing beauty of operatic sound with contemporary fashion and design. As its Executive Director Tonia Cianciulli said to the audience at the beginning of the performance last evening, this new initiative has been a dream of hers for a long time. It came to fruition in two launch concerts at the intimate surroundings of the Sandra Faire and Ivan Fecan Theatre on the York University campus this week. I saw the second show, on Saturday. It starred a mixture of emerging singers and experience veterans, in a varied program from the opera, operetta, and musical theater genres. In addition to the orchestra, the stage was tastefully decorated with contemporary furniture and art work on the two sides, serving as staging areas for the soloists. 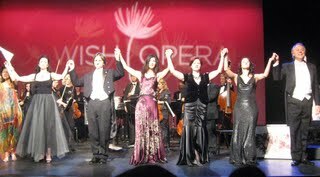 The six women - four singers plus Cianciulli and Emcee Deirdre Kelly - appeared in a succession of smashing high fashion gowns. All four female singers sang a challenging repertoire, each brought to the stage her unique gift of a beautiful voice and lovely stage presence. There were many highlights, but I particularly enjoyed Sinead Sugrue in "Ah fors'e lui...Sempre libera", Ambur Braid in "O zittre nicht" and the crystalline tones of soubrette Vania Chan in Olympia's Aria. Jennifer Fina also impressed with her rich timbre and wide range in "Non piu mesta". The two men of the evening are veterans of the opera stage. Tenor Ermanno Mauro proved that at the grand age of 71, he can still produce a powerful and vital sound and plenty of dramatic intensity, bringing the house down with his "Vesti la giubba." Deputizing for an indisposed James Westman, Theodore Baerg was his ebullient self in a vocally suave and dramatically vivid "Largo al factotum". The evening ended with the trio from Cosi, "Soave sia il vento", a symbolic send-off of Wish Opera to a smooth voyage into the future. Given the current economic climate and the ever-diminishing government support to the arts, any private endeavor like Wish Opera deserves the support of opera and art lovers in Toronto. This new company is planning to stage Mozart's Don Giovanni in two performances on June 24 and 26. Stay tuned!